AgreeYa Solutions India Pvt. Ltd.
Acclaris Business Solutions Pvt. Ltd.
Hytech Professionals India Pvt. Ltd.
H5 Asia Pacific Pvt. Ltd.
Saba Software India Pvt. Ltd. While the focus of the survey was to identify the best small and medium sized IT-BPO companies to work for, it serves as a great list of the best small and medium sized IT-BPO companies to deal with as there is typically very strong correlation between those two. A few posts ago I mentioned a report covering some insights on international freelancing community that was made available by oDesk. Sine then I had a chance to take a deeper look at oConomy and found information there even more interesting and insightful. oDesk did a great job on presenting freelancer statistics in chats and Google mashups. As you can see the figures are somewhat counterintuitive. Take for example Taganrog a small city in the same region as Rostov-on-Don which is roughly 3 times bigger and considerably richer as well, yet freelancer community is 6 times the size of Rostov-on-Don’s. Taganrog is even ahead of Russia’s second largest city Saint Petersburg. Most likely these figures confirm that freelancing community’s embrace of oDesk services is in its humble beginnings and that more business will flow to companies like oDesk, Guru, eLance and others. I hope oDesk keeps oConomy live and updated with the latest info, it would be also great to see their competitors to follow in suite. Questions about offshore rates in different geographies, for different positions and roles come all too often. I covered a few aspects of this subject in my earlier posts, for example Offshore Developer Rates and Negotiating a Fair Rate. 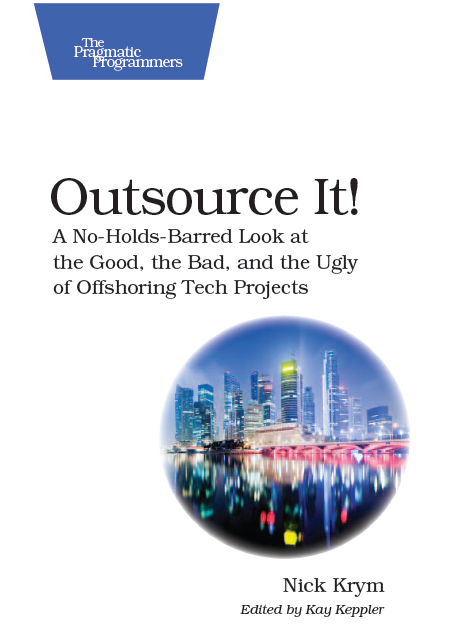 One of the points made in these posts was that the rate is just a contributing factor to the bottom line – the Total Cost of Outsourcing. Nevertheless, the rate is important and getting information about what’s fair for a specific position, geography, region, etc. could be extremely valuable, especially during the initial stage of the vendor selection. Getting ballpark figures for the rates is very simple; all you need to do is just ask. The trick is to understand trends and the negotiation space. For example when a few weeks ago a mid-sized nearshore provider suggested that their standard billing rate is 35-40 USD for QA engineer and 40-50 USD for Java Developer I knew that I am talking with someone with a lots of guts or sense of humor. In a large degree rates are marked up wages. The mark up includes many elements such as employee benefits, operations overhead, sales and marketing overhead, G&A, and so on plus expected margin. When dealing with large providers (public companies) many essential facts and ratios could be found in financial docs that are open to general public. Small vendors can be better at some cost cutting techniques but they loose on the “economy of scale” so the chances are the key ratios would be similar. In that light the question of fair rates comes down to salaries and expected margins. When you negotiating with an offshore vendor the margins are the negotiation space; they can not typically fall below minimally expected and of course never cut into salary. That’s unless the vendor operates under famous model “we lose money on every deal but we make up in volume”. Consider an example: you pick a couple vendors that appear to be fairly similar in most aspects; one of them has ODC based in Shanghai and anther in Shenzhen. Both vendors offer you the same rates. Which of them is more likely to offer steeper discounts? As you can imagine knowing that salary a developer can expect in Shanghai is ~15% higher than in Shenzhen would be helpful. To determine the salary that an average vendor needs to pay to its employees you would need to go through some research. The figures change constantly, substantially and depend on many parameters – local economic situation, dollar exchange rate and specific location being the most important. When looking for just ballpark assessment you can do away without the access to backdoor of the job boards. Just browsing through sufficient number of job ads will give you a great preview. Another simple way to get high level salary info is through rates available on freelancer sites such as elance.com, odesk.com or guru.com. Once again since the goal here is not competitive intelligence but trends analysis the ballpark estimates would do just fine. I just stumbled upon an interesting post – The Top Ten Cities for Outsourcing in India. Bala, a Software Programmer working in Chennai, India refers to several major studies by big name industry analysts that produced the top 10 list. India has 35 major cities, not all of them are good offshore outsourcing hubs, for example India’s financial capital Mumbai is not one of those. The list includes top 10 outsourcing destination in the following order: Chennai, Hyderabad, Bangalore, National Capital Region (NCR) includes Delhi and its surrounding suburbs, Pune, twin cities Chandigarh and Mohali, Kolkata, Mysore, Thiruvananthapuram and Coimbatore. A couple months ago I was talking with Alexandre, a project / account manager from a mid-sized service provider based out of Campinas, an industrial city North of Sao Paulo, Brazil. Alexandre’s team did a great job on one of my past projects and we continue to stay in touch after the engagement ended. The question of Pros and Cons of Brazil outsourcing inevitably came up and I committed to writing this post after some follow with my network and learning a bit more about the destination. Brazil, the first country in the famous BRIC acronym is not one of the first names that come to mind when you consider IT offshoring destinations. I am sure that overtime that will change and Brazil will gain a permanent spot on the list of top players in technology outsourcing. You would probably agree with me if you look just at the list of Pros of that destination; the Cons may affect your opinion but won’t dramatically change it. English Skills. English is a very popular skill and not hard to find with technical professionals in Brazil. However, it’s no match to what you find in India. As a matter of fact when you focus on technical skills sooner or later you will find yourself compromising on English fluency. Government Support. Very interesting topic. According to my connections in Brazil government is unusually supportive in developing IT outsourcing however results of it remain to be seen. Infrastructure. Unless you partner with a very small provider located in a remote province city you will find infrastructure that meets reasonable expectations. In my / my network experience telecom and other aspects of the infrastructure are excellent. Labor Pool / Access to Resources. Brazil employs one of the largest IT communities in the world. The IT work force is large and experienced. This is also a highly educated professional work force as Brazilian universities are fairly competitive to get into and rather inexpensive to stay in. Of course in sheer numbers Brazil falls far behind India and China. Finding top-notch technical resources in Brazil is not easy like everywhere else in the world, yet is possible, even when it comes to cutting edge technologies and methodologies. Educational System. I can not completely agree with Gartner here, while education system in Brazil is not as stellar as in Argentina or Canada when considered from IT stand point it’s at least at par with Chile and Mexico. In my experience the quality of recent grads with CS degrees is very good and that’s rates high on my book. Cost. Pure comparison of the rates with India or China puts Brazil in serious disadvantage. Based on a limited sampling of rates I had access to it is 30-80% higher than rates for comparable resources in India. The difference could be even higher if you try to take into consideration the tier of the city and vendor. On the other hand, as I mentioned numerous times, rate is only a guideline to cost, the total cost of outsourcing has a considerably lower difference. Nearshore advantage. When it come to US based customers Brazil offers nearshore model which is an advantage of high caliber especially for agile projects. Time difference, travel ease, low cultural barriers, etc. institute a huge Pro for Brazil which offsets its high rates to a large degree. First and foremost language issues makes a huge imprint on communications, watch out for idiomatic expressions and professional lingo. Work / life balance. While many of guys in my Brazilian teams worked crazy hours the attitude towards work / career / life balance was quite different, and that is particular notable if there is a beach nearby. In my experience working with Brazilian teams as I noticed that it developers very long time before they could to offer their opinion or disagree with USA team members. That was quite different from Indian “never say no”, it appeared more like fascination with US tech workforce and overly humble judgment of own abilities. Very similar sentiment came from my network as well. Facts and technical quality of the solutions carried less weight with Brazilian team than perceived “authority” of individual. There was also much higher level of sensitivity towards “people feelings” than the one you would typically observe in the states; sometimes to determent of the project. And, in my opinion, common for the entire region tendency to put very high emphasis on theory and academic values versus pragmatic business decisions. Resource Quality / Technical Capability. IT outsourcing in Brazil doesn’t seem to be in the same cut-throat competition with other IT employers as in India. It seems that Brazil is still in a stage when working for outsourcing company considered prestigious and highly desired job. In that light getting your hands on top notch resources is still possible. Turnover Ratio. Turnover ratio claimed by the vendors is low and that has been my experience as well. My limited scope survey gave very positive results with average about 13%. The attrition was also of general nature mainly family issues or education. Not too much of job hopping or inter-company transfers. There is one more issue worth mentioning – finding vendors in Brazil is not as easy as it should be. Hopefully the latest efforts of several outsourcing vendors combined with the government support give us a solid provider directory which will help us in finding those perfect matches made in IT heaven. But for now consider these links as the humble beginnings – www.softex.br, www.brazil-it.com, www.actminds.com, and www.brasscom.org.br. Very interesting statistics made available by oDesk, a freelancing marketplace that now tops 150,000 individuals worldwide in over 100 countries. Freelancing geography as seen from oDesk perspective appears quite different from what we see in trends on geography of regular IT outsourcing, for example US freelancers offer strong competition and reasonable costs. The list of top freelancer countries also includes Canada, Russia and Ukraine rather than China and Brazil.